Sam vs. Lupus: Lupus: Background info. When you hear the word "lupus" do you think of a flower? Many people do. Unfortunately, lupus is not a flower. It is a chronic, incurable and potentially deadly disease that affects an estimated 1.5 million Americans. There are estimated to be at least four times as many lupus patients than Multiple Sclerosis (MS) patients in the USA, yet the disease remains relatively unknown. The chances are very high that you know someone with lupus. Many lupus patients (or "lupies") do not appear to be ill. We may be experiencing debhilitating pain, be on the verge of kidney failure and be taking more medications than a hypochondriac with a pharmacist's license, yet still appear normal. While there are 8-9 times as many female than male lupus patients, the disease can and does occur in both genders. Women from minority populations are more likely to have lupus, but the disease can occur in people from any ethnic background. So a lupus patient can really be anybody you know. Lupus occurs when someone's immune system, which normally serves to fight infections, attacks other parts of the body instead. Unfortunately, lupus can occur in any major organ system, from the brain to the kidneys. It is very common for lupus patients to also have arthritis, skin lesions and to be very sensitive to sunlight. 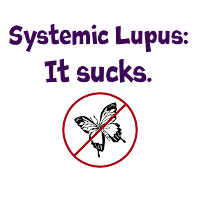 Since the immune system is causing the disease, lupus patients experience the symptoms of a generalized immune response on top of everything else. This is to say that we often run fevers that last for weeks or months, have headaches, are achey and are unable to think clearly. Think about how sick you have to feel in order to stay home from work. During a "flare," during which the disease is particularly active, a lupus patient feels that sick every single day. These flares can last weeks, months, or even years. Lupus is not fun. How is lupus treated? The short answer is that there is no cure for lupus. All doctors can do is to try to kill the immune system enough to keep it from killing the patient. To do this they use anti-inflammatories, corticosteroids, and often chemotherapy. Yes, chemotherapy as in cancer. All of these treatments are non-specific, and prevent the immune system from working appropriately, as well as inappropriately. This means that the lupus patient is often susceptible to infections. It's a "damned if you do, damned if you don't," scenario. The trick is to kill off the immune system just enough to keep it from attacking the body, but not enough to keep it from attacking germs. This is a balance that is not ever perfectly acheived. Lupus patients don't expect you to understand how we are feeling or expect you to be able to solve our problems. But we would very much like you to know what lupus is, so that if we feel comfortable enough with you to tell you that we are sick you don't think we're talking about flowers.